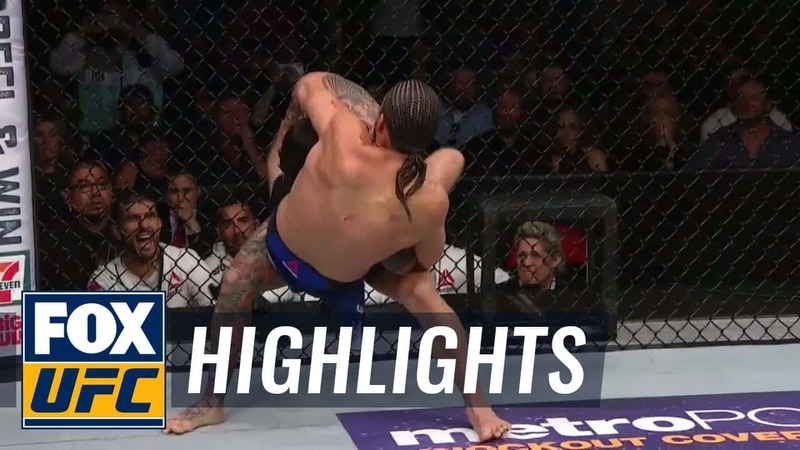 Ortega’s impressive standing-guillotine finish of Swanson, a man unlucky to have not landed a title shot against Holloway at UFC 218, was the highlight of the night in California. Swanson tapped out to signify the end of a four-fight win streak which had brought him agonizingly close to a shot at the reigning champion. It was initially between Frankie Edgar and Swanson for a shot at UFC gold. Edgar got the nod, before being forced to pull out of the fight with a facial injury sustained in training. Swanson felt as though he would have been asked to stand in as the replacement for the former 155-pound champion, until he learned that Jose Aldo was selected in his place. Last night at UFC Fight Night 123, Swanson was given the task of proving to the UFC top brass that he was not going away. Unfortunately for the Californian, Ortega had other ideas. “I felt like I was going to die,” Swanson told those assembled at the post-fight press conference. Swanson also claimed that he was “100 percent” winning the fight prior to being caught by Ortega. The 34-year-old did look comfortable on his feet and stated his intention to attempt to slow his opponent down by paying particular attention to Ortega’s midriff with some cutting kicks and shots. Ortega almost ended the fight towards the end of the first round, locking in on Swanson’s neck who just about managed to maneuver himself out of being choked before the round ended. “It was getting tight and then loosening up, getting tight and then loosening up,” Swanson said. “He was making adjustments, I was fighting it. I was doing all the things I needed to do to create space. Luckily the bell rang, but I felt like I was going to get out. “We know once I started touching him up he was going to get desperate and start to go for stuff, and he’s big and long and it was tricky,” Swanson said. For Swanson, his efforts culminated in a loss and one which will be painfully hard to take. This bout was the last on his deal with the UFC and if things could have gone another way, there is a chance that he could have had a title shot which may have possibly won him a title. “I’ve been saying, I really want to help people out,” Ortega said. “I want to use this light – to not just have it on me. They invested a lot of money to promote me and everything. And now that my name is getting out there, I want to help people out. That’s my main thing. I love kids. I love helping kids out. I’m not the perfect person, but I have the perfect heart, I feel, when it comes to helping people. Check out the highlights of Ortega’s win over Swanson above.